A little while ago someone said to me “You must have come across a lot of maps in your career, do you have a favourite?” My response was kind of a let down to them. I told them I’d never really thought about it too much. After all how do you compare a thematic map to a reference map, an abstract map to a very functional navigational chart? However, this interesting question sent me on a search to find my favourite map. I dug up old books, read through other ‘best of’ lists, and reached into my treasure chest of maps to put together the following list. Yes, it’s a list. Like I had thought, it was impossible to pick an all time favourite, so I did my best and narrowed it down to five (it was 20 at one point!). The maps below are all incredible pieces of cartography; mixing art, genius, technology and money. They’re all emotionally addictive, they are unrivaled in their appearance and impact, and I never get tired of seeing, nor using them! Below I present my 5 all-time favourite maps (in no particular order). Lieutenant Matthew Flinders (1774-1814) was the first person to circumnavigate Australia, charting almost of the entire coastline from 1801-1803. At aged 26 (yes that’s right, aged 26!) he set off on HMS Investigator to chart the Great Southern Land. I have a huge level of respect for these maps. 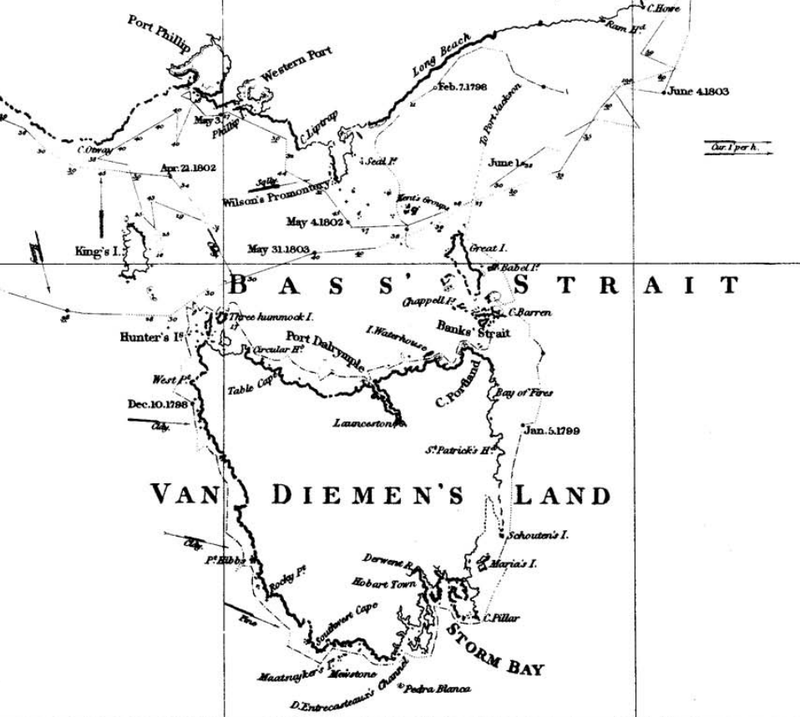 The accuracy of the coastline, the typography, and the features noted on this chart are mind blowing given the period, and the conditions aboard Flinders’ voyage. This map like many others during this period ooze class and authority. 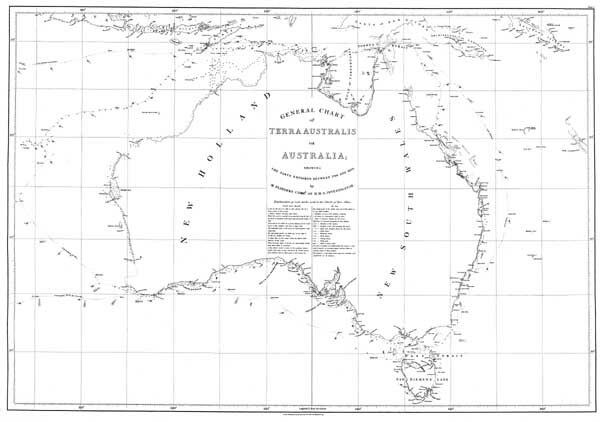 How could I not love this map, after all it’s the first map to show the word ‘Australia’ on it! Those that know me will see it as no surprise that there is at least one atlas in my list of all time favorites maps (to be honest I could have filled this list with 5 atlases!). But which one? Should it be The Atlas of Switzerland by Imhof, the World Geo-Graphic Atlas by Herbert Bayer, the first Times Atlas, or perhaps the modern day goliath Earth Platinum? The atlas I love the most right now is Raisz’s Atlas of Global Geography. Inside the simple cover of this little gem lies some of the most well thought out, beautifully presented atlas spreads I’ve ever seen. The impact of each spread is infectious, encouraging you to turn more pages, but at the same time tying you to each page to digest the cultural, physical and thematic content that is carefully laid out on each spread. 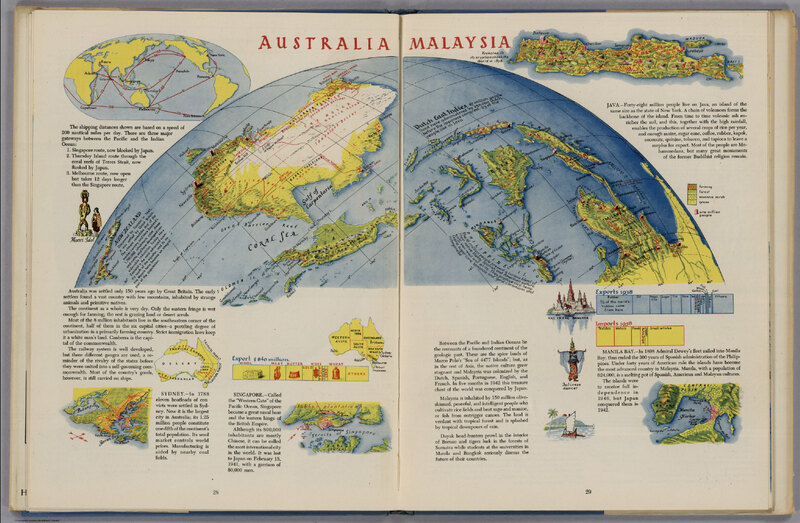 Seventy years later the Oblique Orthographic projections used throughout the atlas provide a refreshing view of our complex and fascinating world. An old school classic indeed! From small scale maps in Raisz’s atlas to one of the most incredible hand drawn large scale city maps you will ever see. 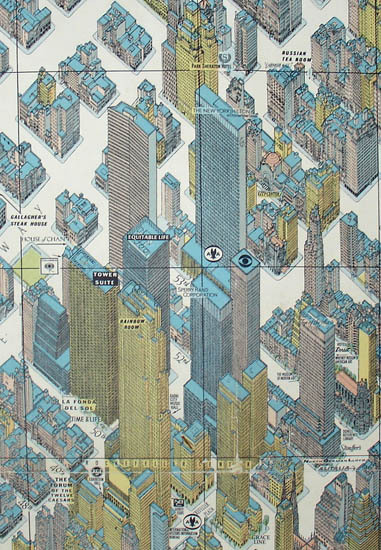 Hermann Bollmann drew this classic map of New York back in 1962. 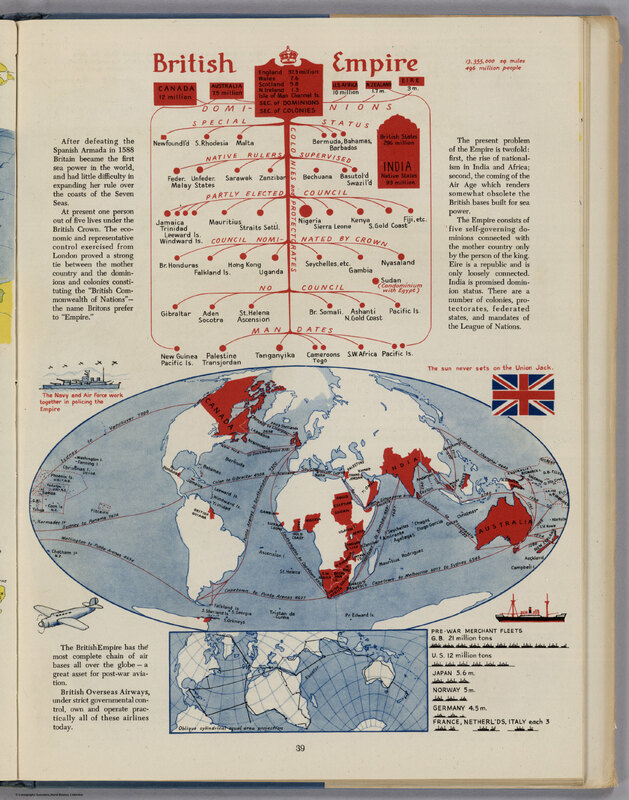 I was first introduced to Bollmann’s map in a cartographic design class at university. I remember being blown away by it then, and still now I find it largely unimaginable! I love how it works so well at so many levels. You can stand back and be blown away by it or you can dive deep and check out every single window of the Empire State Building! A true masterpiece of ’3D’ urban mapping. We leave the city and enter the art-mountain world of Mr Imhof. 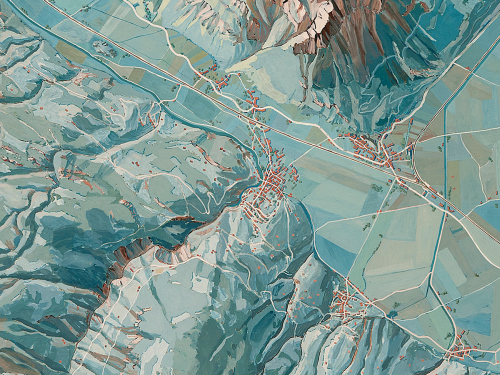 If there was ever a genius that was able to merge geo and art it was Professor Eduard Imhof. Imhoff’s giant Karte der Gegend um den Walensee which he painted back in 1938 using “free artistic interpretation” as he calls it is in my opinion his best work. Measuring in at 480 x 200 cm this monumental map is without doubt my favourite piece of artistic cartography. The map is on permanent display at the Swiss Alpine Museum in Bern and I hope to one day lay my eyes on the original masterpiece. Google Maps. What can I say? A tech company who indexed the entire internet connected us to this modern day marvel back in 2005. Google Maps (or simply Maps as Google calls them) has become the default map for millions of people each and every day searching, navigating and exploring place. Not content to simply index the internet Google began indexing the geographic world around us creating a mapping project at a scale never seen before. 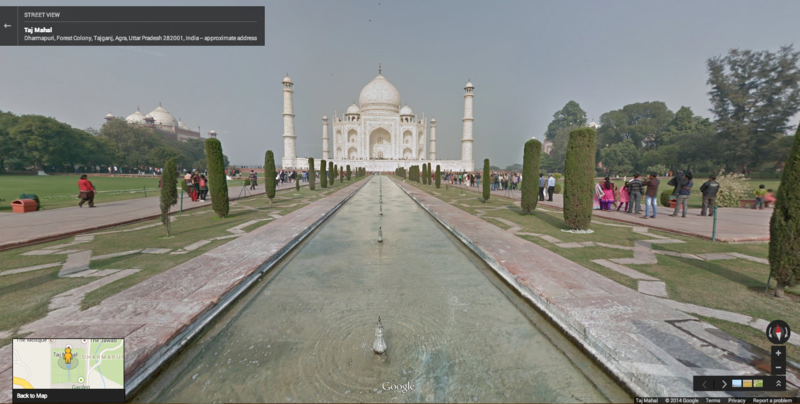 Their maps rarely fail you, Street View is genius, and 99 times out of 100 their maps just work. And who doesn’t love carrying the world around in their hand? Few companies have the deep pockets which Google does to fund a billion dollar a year global mapping program like this (and do it well, wink wink Apple! ), but I’m thankful along with millions of others that they do, else we’d all be lost in this 21st century. So there you have it. My top 5 favourite maps. 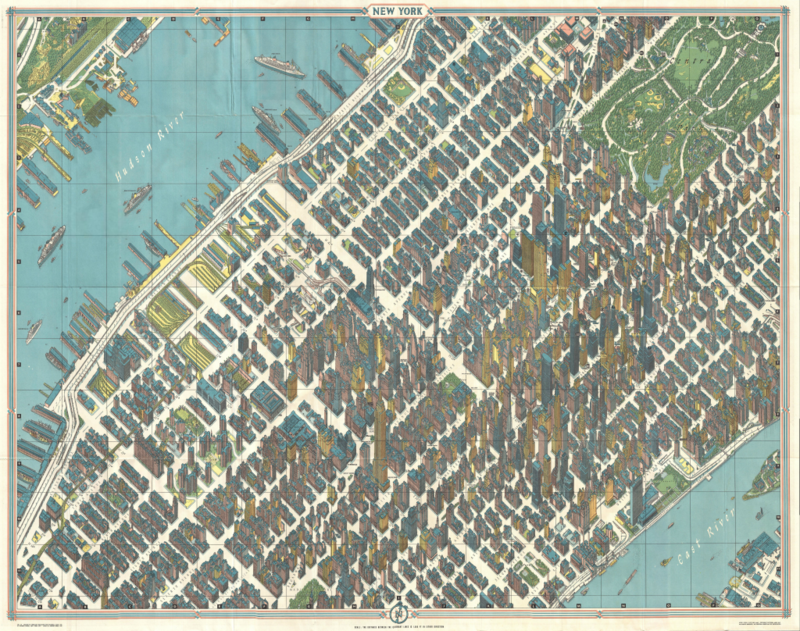 An incredibly diverse and wonderful collection of historic and modern day maps. Maps that I aspire to, love looking at and love using. Now a little word of warning here. My favourite maps tend to change from month-to-month depending on my mood, the occasion, and what I’m working on. Kind of like my most played list on Spotify! But right now these five maps are topping my all time list.